A cold front will deliver rain Wednesday into Thursday, but we continue to monitor the tropics carefully due to rough surf and potential weather concerns. Gaston continues to head off into the sunset of the northern Atlantic. However, it continues to spit out increased swell toward the Jersey Shore, keeping surf rough and the rip current risk elevated for at least another day. MORE: Rip currents and rough surf, so what? 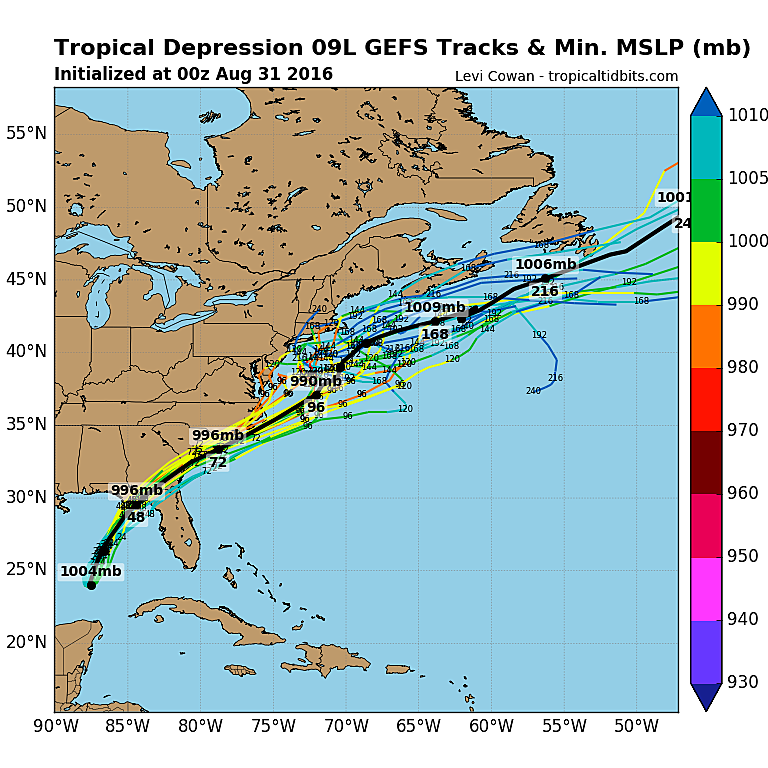 Meanwhile, Tropical Depression 8 was located just off the North Carolina coast. The forecast has called for T.D. 8 to make a sharp left turn out to sea. As that track is verifying, the storm looks to have no direct impacts on New Jersey. Our surf will continue to get churned up for the rest of the week. T.D. 9 was located in the middle of the Gulf of Mexico as of 5 a.m. Wednesday. An upgrade to a tropical storm is expected any time now, as it eyes the coast of the Florida panhandle and Nature Coast for landfall late Thursday. 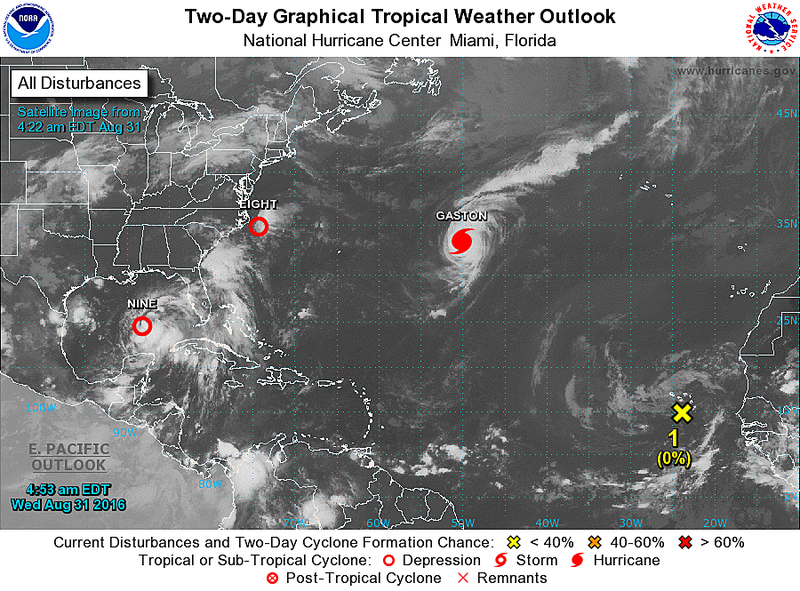 After traversing inland through Florida, Georgia, and possibly South Carolina, the system will re-enter the Atlantic Ocean and parallel the U.S. East Coast through the Labor Day Weekend. The closer the storm stays to the coast (i.e. the further west the track), the bigger the impact on New Jersey. Over the past 12 hours, the forecast track for T.D. 9 has indeed wiggled slightly westward. So far, the shift isn't enough to warrant a change to New Jersey's weather forecast. But it's enough to keep watching the storm carefully. Best case scenario? Our weather stays sunny and dry through the entire holiday weekend, although it's almost certainly going to be rough along the Jersey Shore. Even if the bands of clouds and rain stay over the ocean, a high risk for rip currents will accompany some pretty big waves and possibly minor coastal flooding. Worst case scenario? Sunday and Monday could bring a lot of rain and some wind, along with the rough surf and coastal concerns too. I don't want to say it would "only" be a tropical depression or tropical storm at the time, since the impacts can still be dangerous and quite dramatic. Such storms are moisture machines, and could produce an exorbitant amount of rain if it hugs the coast closely. When will we know more? IF there are any alarm bells to sound for New Jersey, we'll probably do that after the storm makes landfall in Florida on Thursday night-Friday morning. Enough about the tropics, lets talk about our impending weather. Totally unrelated to the tropical depressions above is a cold front that will push toward New Jersey from Wednesday night into Thursday. Rain is expected to develop ahead of this front. I don't think the rain is going to be particularly heavy, but it might be steady at times and might make for an overall grey, somewhat gloomy day for Thursday. It's probably not going to be a drought-busting rain, but every drop helps in parched North Jersey right now. Timing? Showers will push into far North Jersey (north of I-80) Wednesday afternoon, spreading south and east through Wednesday night. The heaviest rain looks to fall Thursday morning. The rain should taper off completely by Thursday late afternoon or evening. Totals? A general 0.1" to 0.6" is expected across New Jersey. In case of an embedded thunderstorm or downpour, upwards of 1.5" could fall in spots. Big Issues? Not really - I think the risk for flooding and severe weather will be very low. Our atmosphere doesn't look to tap into the moisture of Tropical Depression 8, so it's just run-of-the-mill rain instead of a tropical deluge. By Friday morning, dew points and relative humidity will plummet as dry air returns to New Jersey. That, along with arriving high pressure, will clear out skies and make for a nice stretch of days. Scattered clouds will accompany a stiff northerly breeze on Friday. High temperatures will be limited to about 80 degrees as our new air mass arrives. The Labor Day Weekend gets even cooler - still very nice, but I'm just not sure it's warm enough to qualify as perfect beach weather. Saturday's and Sunday's high temperatures look to peak in the mid to upper 70s across the Garden State. Labor Day Monday should be a bit warmer in the lower to mid 80s. Keep in mind, this pleasant, dry weekend forecast is predicated on the going forecast that all tropical systems stay away from New Jersey. IF Tropical Depression 9 wiggles closer to the coast, we may need to adjust the forecast accordingly. No matter how blue our skies become this weekend, the ocean is going to be angry. Swimming is already dangerous, and may become even more hazardous as storms may close passes to the Jersey Shore. Don't be stupid - stick to the beach and boardwalk, and stay away from the crashing waves.